The following piece was researched and written by Hak Hakanson, who long ago worked as a bridge inspector for the US State of Pennsylvania and clearly remains dedicated to the subject! This page is part of allaboutpai.com, which has lots of information about Pai, a town in the mountains of Northern Thailand. For the last several decades, Pai locals and tourists alike have visited the so-called "Japanese WWII Bridge," an old steel truss bridge that crosses the Pai River right alongside main highway 1095, about 4km south of Pai in the hot spring village of Tha Pai. However, as this document will reveal, the bridge is most definitely not of Japanese origin. In 2007, in order to elevate its status as a tourist attraction, the bridge was renovated and repainted, and a new and permanent public display was added at the southeast approach. The new display corrects the story somewhat, admitting that the steel truss bridge was erected not by the Imperial Japanese Army during WWII, but rather by a Thai government entity around 1976. However, the new display claims that the bridge spans come from the old Nawarat Bridge in Chiang Mai (which was removed around 1966 to make way for the current reinforced concrete structure). As this document will clearly show, this is also not the case! So we have ourselves a mystery. Where did the spans of this bridge really come from? Were they added at the same time? Do verifiable photos exist of any bridge at this river crossing from WWII? This page is an excerpt from a larger, detailed, evolving report about the Tha Pai bridge; email us at the address above if you're interested in seeing the full report. Any connection between the Tha Pai Bridge and the old Nawarat Bridge is easily disproven by a simple comparison of the two. The other four spans of the old Nawarat Bridge were identical. Tha Pai's Warren trusses are quite different from the Pratt trusses of the Nawarat. Should the question arise, no, it wouldn't have made economic sense to have modified two spans from the Nawarat to take on this new appearance. Thus, spans S1 and S2 of the Tha Pai River Bridge could not have come from the old Nawarat Bridge. It is an odd detail, but the point is that the steel for that span did not come from the Nawarat. It is safe to say that none of the Spans S4, S5, and S6 came from the old Nawarat. The technology used in fabricating Span 7 is a generation later than that used in the old Nawarat Bridge. It could not have come from the Nawarat. The simple conclusion to be drawn is that none of the spans on the old Tha Pai steel bridge came from the old steel truss Nawarat Bridge. That said, the old Tha Pai Bridge, as it stands today, offers a unique selection of steel truss bridges in one spot that should be properly identified, described, and evaluated, for all to enjoy. Do verifiable photos exist of the bridge at the river crossing from WWII? 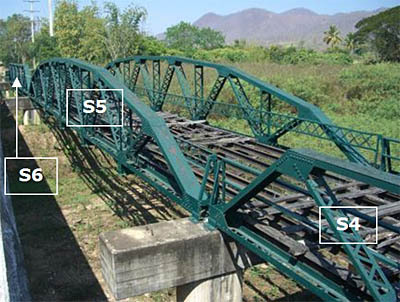 From where were the three main sets of spans (S1 & S2; S4, S5 & S6; S7) relocated? 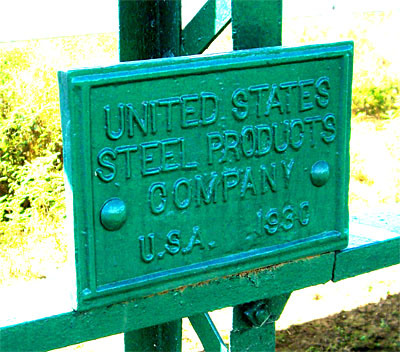 Does anyone know any details about those spans, such as manufacturer or date of manufacture? Is there any record of spans S1, S2 & S3 having been added at a date later than the other spans (this is one possible explanation for Piers P2 & P3 being so close together)? Why are the trusses in spans S4, S5 & S6 so peculiarly configured? Text and images from Hak's article are copyright 2009 Hak Hakanson.